The embryonic developmental process in avian species is quite different from that in mammals. The first cleavage begins 4 h after fertilization, but the first differentiation does not occur until laying of the egg (Eyal-Giladi and Kochav (EK) stage X). After 12 to 13 h of incubation (Hamburger and Hamilton (HH) stage 3), the three germ layers form and germ cell segregation in the early chick embryo are completed. Thus, to identify genes associated with early embryonic development, we compared transcript expression patterns between undifferentiated (stage X) and differentiated (HH stage 3) embryos. Microarray analysis primarily showed 40 genes indicating the significant changes in expression levels between stage X and HH stage 3, and 80% of the genes (32/40) were differentially expressed with more than a twofold change. Among those, 72% (23/32) were relatively up-regulated at stage X compared to HH stage 3, while 28% (9/32) were relatively up-regulated at HH stage 3 compared to stage X. Verification and gene expression profiling of these GeneChip expression data were performed using quantitative RT-PCR for 32 genes at developmental four points; stage X (0 h), HH stage 3 (12 h), HH stage 6 (24 h), and HH stage 9 (30 h). Additionally, we further analyzed four genes with less than twofold expression increase at HH stage 3. As a result, we identified a set of stage-specific genes during the early chick embryo development; 21 genes were relatively up-regulated in the stage X embryo and 12 genes were relatively up-regulated in the HH stage 3 embryo based on both results of microarray and quantitative RT-PCR. We identified a set of genes with stage-specific expression from microarray Genechip and quantitative RT-PCR. Discovering stage-specific genes will aid in uncovering the molecular mechanisms involved the formation of the three germ layers and germ cell segregation in the early chick embryos. In embryogenesis, a series of developmental events begins immediately after fertilization. During the early embryo development, the expression of many genes is spatiotemporally triggered or suppressed, under tight transcriptional control. However, the intricate changes in gene expression in the early embryo have yet to be investigated in detail in mammals or birds. As avian species are oviparous, the embryo is readily accessible even at the earliest stages and can effectively be manipulated for purposes including profiling the genes expressed in embryogenesis. Recently, the chicken genome was completely sequenced , and furthermore, Burt et al  reported that the organization of the human genome is actually closer to that of the chicken than the mouse. Thus, the chicken is an interesting and relevant experimental animal model. In avian species, the embryonic developmental process is quite different from that in mammals. The first cleavage begins 4 h after fertilization, as the embryos enter the magnum of the reproductive duct , but the first differentiation does not occur until the egg is laid. Cells in the embryo continue to proliferate until the Eyal-Giladi and Kochav stage X and the laid egg consists of 40,000 to 60,000 undifferentiated embryonic cells . After 12 to 13 h of incubation at Hamburger and Hamilton (HH) stage 3, the primitive streak extends to about the center of the area pellucida . The groove in the primitive streak is gradually established as the cells of surrounding epiblast rapidly divide and migrate to the lower regions of the embryo, where they spread laterally across the surface of the yolk into two layers, the endoderm and mesoderm. Together with when the three germ layers begin to form, the first appearance of germ cells is an important event during the early embryo development. Primordial germ cells, the progenitors of sperm or egg cells after sexual maturity, first appear from the epiblast in the blastoderm at stage X and translocate to the hypoblast of the area pellucida [6–8]. During gastrulation, they circulate through the vascular system and finally settle in the gonadal anlagen . Understanding the molecular mechanisms that underlie germ cell segregation during early embryogenesis is important not only from the perspective of fundamental research in embryology but also from that of practical use of genetic methods. Additionally, discovering developmental stage-specific genes will aid in uncovering the molecular mechanism involved in the early stages of chicken embryo development. In this study, we investigated the linkage of gene expression with morphological events, including germ cell segregation and identified gene transcripts from microarray GeneChip technology (stage X versus HH stage 3). We further analyzed our gene expression data using quantitative RT-PCR. Microarray analyses were conducted to identify genes that were differentially expressed between Eyal-Giladi and Kochav stage X and Hamburger and Hamilton (HH) stages 3 embryos. Raw expression levels were corrected and normalized using the RMA function and the affy software. A correlation matrix showed that the between-group variances were higher than the within-group variances (Figure 1). Hierarchical clustering was conducted upon all probes by using Cluster, and the clustering result was displayed using TreeView software (Figure 2). Plot of correlation matrix between all pairs. The ellipse represents a level curve of the density of a bivariate normal with the matching correlation that shows the group variances are higher than the within variances. Each sample was performed in triplicate. Clustering result of the microarray experiment. Clustering is conducted from the normalized expression data of all probes. Each row represents the relative gene expression of a single gene. 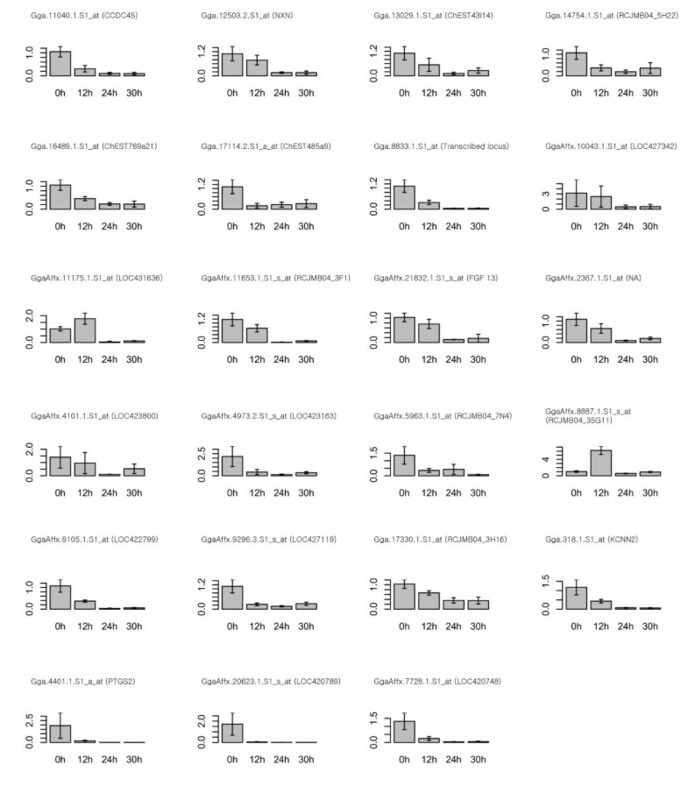 Each column represents a sample. 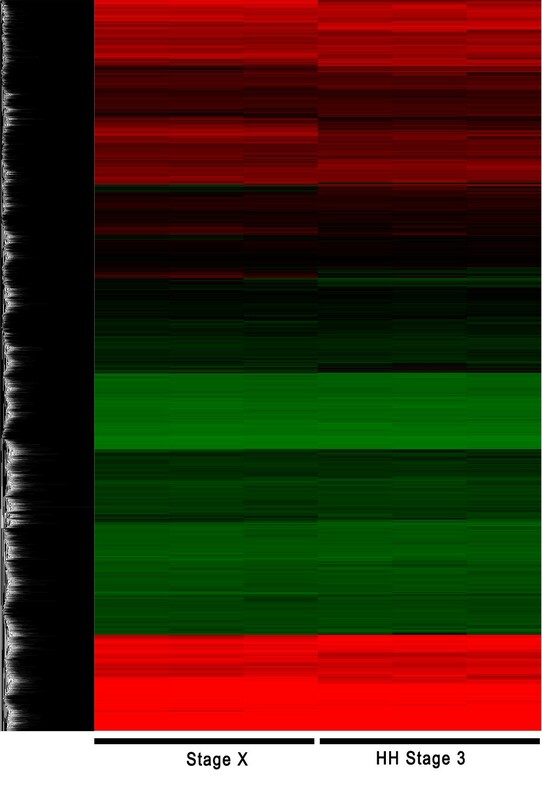 High expression relative to mean are colored red, and low expression relative to mean are colored green, and Black represents mean expression levels of the experiment. The clustering result is displayed by using TreeView software. Microarray analysis primarily showed 40 genes indicating the significant changes in expression levels between stage X and stage 3; 27 were up-regulated in the stage X embryo (Table 1) and 13 were up-regulated in the HH stage 3 embryo (Table 2). 80% (32/40) of these genes were differentially expressed with more than a twofold change. Among those, 72% (23/32) were relatively up-regulated at stage X compared to HH stage 3, while 28% (9/32) were relatively up-regulated at HH stage 3 compared to stage X. To verify and further characterize the GeneChip expression data, quantitative RT-PCR was performed. aGene transcripts were classified using NetAffx analysis tool provided by the Affymetrix. bLog2 fold changes calculated from the microarray data (right column) are indicated. Log2FC > 1 indicates that gene expression at stage X was up-regulated more than twice than that at HH stage 3. NA is not annotated from NetAffx analysis tool. bLog2 fold changes calculated from the microarray data (right column) are indicated. 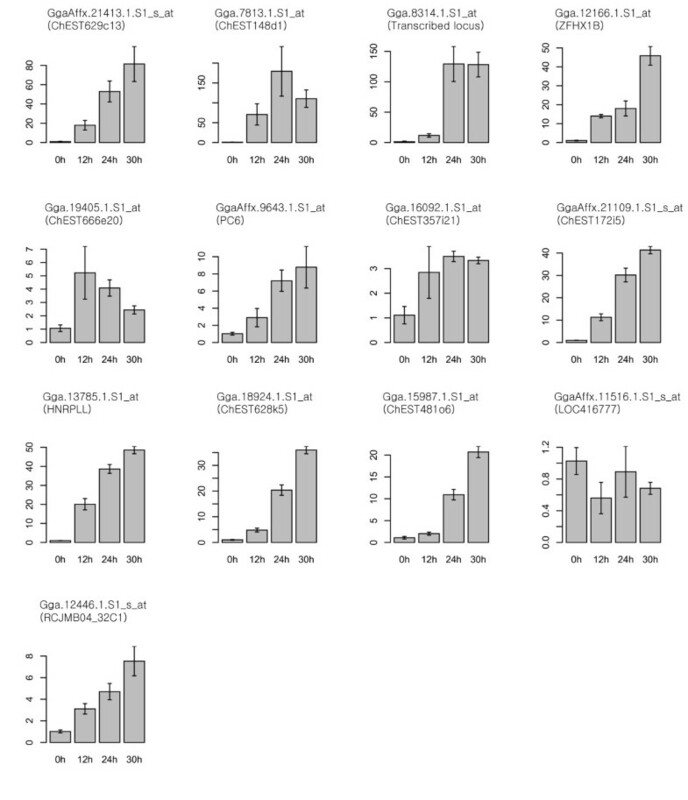 Log2FC < -1 indicates that gene expression at stage X was down-regulated more than twice than that at HH stage 3. NA is not annotated from NetAffx analysis tool. The microarray gene expression data were confirmed using quantitative RT- PCR for 32 genes showing the more than twofold changes in expression levels between stage X and HH stage 3. Additionally, we further analyzed 4 genes with less than twofold increase in expression at HH stage 3 compared to stage X. Although cut-off was less than twofold, these extra genes might be important in morphological events including germ cell segregation. Thus, expression profiles of total 36 gene transcripts (23 and 13 at stage X and HH stage 3, respectively) were quantified by RT-PCR (Table 3, 4). Furthermore, to investigate expression patterns of those transcripts during the early chick embryo development, we extended embryo development stages from stage X to HH stage 9 and prepared total mRNAs from 4 developmental points for quantitative RT-PCR; stage X (0 h), HH stage 3 (12 h), HH stage 6 (24 h), and HH stage 9 (30 h). Most (91.7%, 33/36) of gene transcripts were consistent with results as shown in microarray data analysis between stage X and HH stage 3. 21 genes were relatively up-regulated in the stage X embryo (Figure 3) and 12 genes were relatively up-regulated in the HH stage 3 embryo (Figure 4). However, 2 genes (GgaAffx.11175.1.S1_at and GgaAffx.8887.1.S1_s_at) at stage X and 1 gene (GgaAffx.11516.1.S1_s_at) at HH stage 3 showed the opposite results in quantitative PCR analysis compared to microarray data. The relative gene expression profiles of stage-specific genes were also confirmed from stage X (0 h) to HH stage 9 (30 h) (Figure 3, 4). Based on the quantification RT-PCR results, Hierarchical clustering was performed (Figure 5). NA is not annotated from NetAffx analysis tool. List of the primer pairs for quantitative RT-PCR. Thirteen genes were selected as being up-regulated in Hamburg and Hamilton (HH) stage 3 embryo from microarray data. Quantification of the relative expression of the 23 genes selected as being up-regulated in stage X embryo compared to Hamburg and Hamilton (HH) stage 3. Quantitative RT-PCR was conducted at stage X (0 h), HH stage 3 (12 h), HH stage 6 (24 h), and HH stage 9 (30 h) embryos. The relative quantification of gene expression was analyzed by the 2-ΔΔCt method. NA is not annotated from NetAffx analysis tool. Quantification of the relative expression of the 13 genes selected as being up-regulated in Hamburg and Hamilton (HH) stage 3 embryo compared to stage X. Quantitative RT-PCR was conducted at stage X (0 h), HH stage 3 (12 h), HH stage 6 (24 h), HH stage 9 (30 h) embryos. The relative quantification of gene expression was analyzed by the 2-ΔΔCt method. Hierarchical clustering of differentially expressed genes analyzed by quantitative RT-PCR. Based on the microarray analysis, the 23 genes selected as being up-regulated at stage X and the 13 genes selected as being up-regulated at HH stage 3 were confirmed by quantitative RT-PCR at stage X (0 h), HH stage 3 (12 h), HH stage 6 (24 h), and HH stage 9 (30 h). Most (91.7%, 33/36) of genes were consistent with results as shown of microarray data analysis. 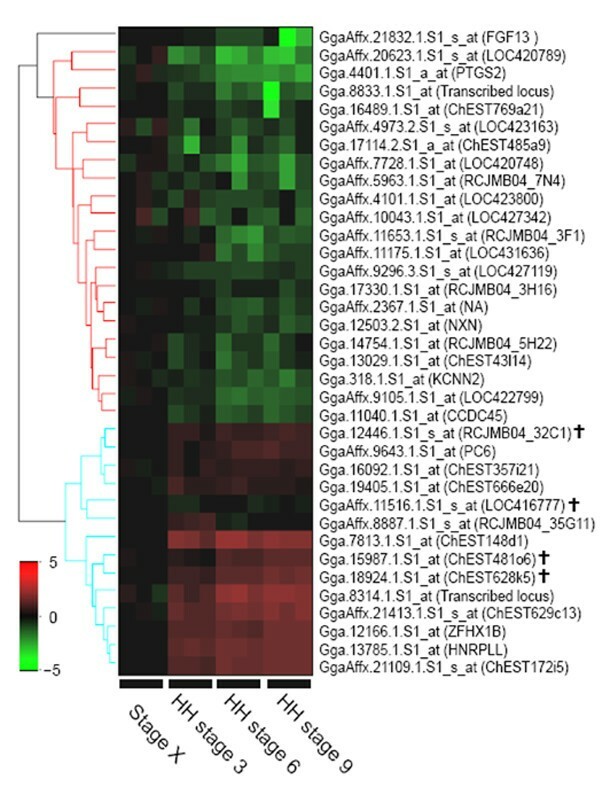 Color indicates the relative expression levels of each gene, with red indicating higher expression, green indicating negative expression. Black represents a control group that is normalized for the relative quantification of gene expression. Four genes with less than twofold expression increase at HH stage 3 were indicated (≸). NA is not annotated from NetAffx analysis tool. Recently, with chicken genome data and advances in DNA microarray technology, integration of these genomic data with the wealth of existing descriptive embryology will strengthen the position of the chicken embryo as a useful experimental model [10–13]. The chicken embryo provides an excellent model system for studying the developmental biology of vertebrates because of the accessibility of the chick embryo, allowing embryonic manipulations that are not possible in a mammalian system. But, there are few reports on microarray GeneChip technology and functional genomics for profiling gene transcripts expressed during early embryo development in avian species. To investigate the linkage of gene expression with morphological events, including germ cell segregation, we examined differentially expressed genes between undifferentiated Eyal-Giladi and Kochav (EK) stage X and differentiated Hamburger and Hamilton (HH) stage 3 chicken embryos. Specifically, we used microarray GeneChip technology to identify a set of genes with stage-specific expression, and its results were confirmed by the relative gene expression profiling using quantitative RT-PCR. From our results based on both of microarray and quantitative RT-PCR, we identified a set of stage-specific genes in the developing chick embryo: 21 genes were relatively up-regulated in stage X embryo and 12 genes were relatively up-regulated in the HH stage 3 embryo. Confirming GeneChip results with quantitative RT-PCR is important in determining whether a specific transcript is truly up- or down-regulated. Our quantitative RT-PCR results demonstrated a higher than 90% concordance with the GeneChip data, consistent with the findings of Rajeevan et al. . Their results showed a similar the degree of agreement between GeneChip and QRT-PCR and that the agreement was related to hybridization intensity, with the highest level of concordance for those genes with the highest signal intensity on the GeneChip. From the quantitative RT-PCR in this study, most (21/23) of genes up-regulated in stage X embryo gradually decreased according to developmental process, while almost (12/13) of genes up-regulated in HH stage 3 embryo were relatively higher than in stage X and increased according to ages of incubation time until HH stage 9 (30 h). However, three gene transcripts (2 at stage X and 1 at HH stage 3) showed the discrepancy between microarray data and the quantitative RT-PCR analysis. Thus, further intensive experiments such as Northern blot and in situ hybridization as well as functional study would be conducted. The freshly laid egg, at stage X, consists of 40,000 to 60,000 undifferentiated embryonic cells. At this stage, notably, anti-oxidation-related transcripts such as Gga.12503.2.S1_at (Nucleoredoxin) and Gga.4401.1.S1_a_at (prostaglandin-endoperoxide synthase 2) were expressed higher than at HH stage 3. Oxidative stress is one of the main damage sources in living organisms, and the anti-oxidant defence mechanisms of biological systems play major roles in preventing oxidative stress and the consequent cell damage . Thus, higher expression of anti-oxidation-related transcripts could be one of the critical mechanisms for survival at stage X embryo. Signal transduction pathways are known to play key roles in cell fate commitments during early embryogenesis. FGF13, highly expressed in stage X embryo, would be involved in the signalling transduction during the early chick embryogenesis. FGF signaling not only mediates cell fate specification in the early embryo but also maintains an undifferentiated cell state in many cellular contexts . Streit et al  suggested that FGF secreted from a population of organizer precursors initiates induction of neural system before the beginning of gastrulation and Sato et al  reported that in human embryonic stem cells, FGF2/13 expression is enriched and important to understand the molecular mechanisms underlying stemness. At HH stage 3 (12 h of incubation), three germ layers and germline segregation with the appearance of primordial germ cells (PGCs) begin to form in chick embryogenesis. Since the number of these PGCs is rare at the early developmental stags, it would be difficult to investigate the germline-specific genes. In this study, 12 gene transcripts which were relatively up-regulated in HH stage 3 embryos might be important in germ cell segregation as well as morphological events. Interestingly, Gga.12446.1.S1_s_at, transcript up-regulated at HH stage 3, was gallus gallus staufen homolog to Drosophila STAU1 and gradually increased during developmental process. Staufen, a double-stranded RNA binding protein, was first identified in Drosophila as an essential factor required for germline specification and the anterior-posterior axis formation . Ramasamy et al. recently reported that Zebra fish Staufen1 and Staufen2 are required for the survival and migration of primordial germ cells. Septin2 (GgaAffx.11516.1.S1_s_at), GTP-binding protein, is involved in cytokinesis in various species from yeast and vertebrates . Expression level of Septin2 was significantly found in mouse embryonic heart in a developmentally regulated fashion and gradually down-regulated around birth . In our GeneChip data, Septin2 were expressed higher at HH stage 3 than at stage X and it might be that embryonic cells actively proliferate and organogenesis begins during gastrulation. However, the results from quantitative RT-PCR showed septin2 transcript consistently expressed from stage X to HH stage 9. Thus, spatiotemporal regulation(s) of septin2 transcript expression remain to be further investigated. Although the number of genes analyzed in this study was limited, our data would be contributed to understanding how developmentally important genes are integrated with developmental processes and germline segregation during early embryogenesis in the chicken. Further experiments examining in situ cellular expression and functional properties of the identified genes would be needed to elucidate the transcriptional control mechanisms of gene expression associated with early embryogenesis in chickens. In this study, we identified a set of genes with stage-specific expression using microarray Genechip and quantitative RT-PCR during the early embryo development in avian species. Discovering stage-specific genes will aid in uncovering the molecular mechanisms involved the formation of the three germ layers and germ cell segregation in the early chick embryos. Experimental animals for this study were maintained at the University Animal Farm, Seoul National University, Korea. All experimental procedures were performed at the affiliated laboratories of the university. Eggs were brought to the lab within 1 to 3 h of oviposition for stage X embryos . Developing embryos under relative humidity of 60–70% at 37.8°C were staged according to the Hamburger and Hamilton (HH) classification system . 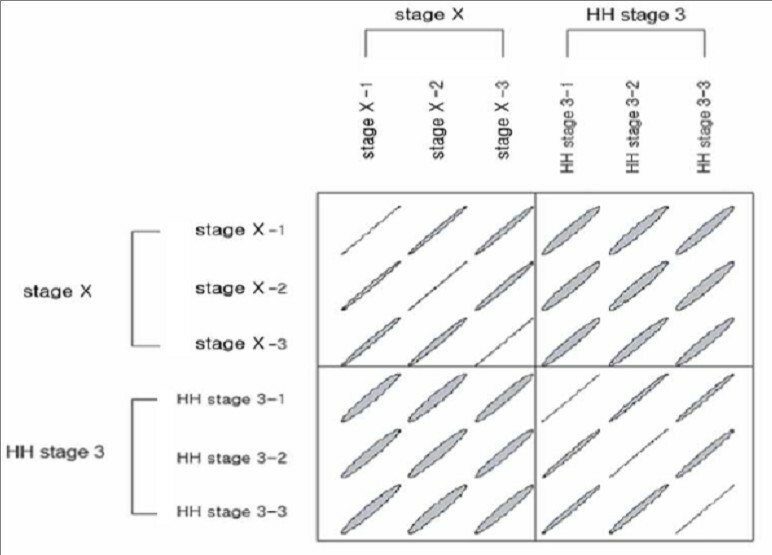 Thus, Eyal-Giladi and Kochav (EK) stages X, Hamburg and Hamilton (HH) stage 3, HH stage 6, and HH stage 9 correspond to embryos at 0 and 12 h, 24 h, and 30 h of incubation, respectively. Total RNA from embryos at each stage was isolated using the TRIzol Reagent (Invitrogen, Carlsbad, CA), according to the manufacturer's instructions. RNA quality was checked by agarose gel electrophoresis and RNA quantity was determined by spectrophotometry at 260 nm. RNA was then further purified using the RNeasy kit (Qiagen, Valencia, CA). The total RNA was used for gene expression analysis on an Affymetrix GeneChip Chicken Genome Array (Affymetrix, Santa Clara, CA), containing 38,535 probes. All experiments were performed in triplicate. The generation of GeneChip data from the embryos of stage X and HH stages 3 was performed by Seoulin Bioscience Corporation (Seoul, Korea). Specifically, total RNA (about 5 μg) from stage X and HH stages 3 embryos was used for labelling. Probe synthesis from total RNA samples, hybridization, detection, and scanning were performed according to standard protocols from Affymetrix. Briefly, cDNA was synthesized using the One-Cycle cDNA Synthesis Kit (Affymetrix). Single-stranded (ss) cDNA was synthesized using Superscript II reverse transcriptase and T7-oligo (dT) primers at 42°C for 1 h. Double-stranded (ds) cDNA was obtained using DNA ligase, DNA polymerase I, and RNase H at 16°C for 2 h, followed by T4DNA polymerase at 16°C for 5 min. After cleanup using a Sample Cleanup Module (Affymetrix, Santa Clara, CA), ds cDNA was used for in vitro transcription (IVT). cDNA was transcribed using the GeneChip IVT Labeling Kit (Affymetrix) in the presence of biotin-labeled CTP and UTP. Then the biotin-labeled IVT-RNA was fragmented and hybridized to the chicken genome GeneChip array at 45°C for 16 h, according to the manufacturer's instructions. After hybridization, the arrays were washed in a GeneChip Fluidics Station 450 with a non-stringent wash buffer at 25°C, followed by a stringent wash buffer at 50°C. After washing, the arrays were stained with a streptavidin-phycoerythrin complex. After staining, intensities were determined with a GeneChip scanner, controlled by GeneChip Operating Software (GCOS; Affymetrix). The quality of the array image was assessed as described in the GeneChip expression analysis manual (Affymetrix). All arrays were processed to determine the "robust multi-array average" (RMA; ) using the "affy" software package . Expression values were computed in detail from raw CEL files by applying the RMA model of probe-specific correction for perfect-match probes. These corrected probe values were then subjected to quantile normalization, and a median polish was applied to compute one expression measure from all probe values. Resulting RMA expression values were log2-transformed. Clustering from the normalized expression data of all probes was performed and displayed using Cluster and TreeView software . Individual gene expression levels from embryos at stage X and HH stages 3 were compared using an unpaired Student's t-test. The Benjamini-Hochberg correction for false discovery rate (FDR) was used for all probe-level normalized data. We selected differentially expressed genes that met the following criteria: a change in expression of at least twofold when comparing the means of the two groups and a FDR-adjusted P value of less than 0.01 according to the unpaired Student's t-test. Gene Ontology annotation was conducted using NetAffx tool provided by the Affymetrix . Further analysis for functional annotation clustering was performed using the DAVID database  [see Additional file 1]. To confirm the GeneChip expression data and the relative gene expression profiling, quantitative RT-PCR was performed at the developmental stages. Based on microarray data, we selected 36 genes and primers were designed using the Primer 3 software  on sequences from the GenBank database (Table 3, 4). For quantitative RT-PCR, we extended embryo development stages from stage X to stage 9 and so prepared total mRNAs from 4 developmental points; stage X (0 h), HH stage 3 (12 h), HH stage 6 (24 h), and HH stage 9 (30 h). sscDNA was synthesized from total RNA (1 μg) using the Superscript III First-Strand Synthesis System (Invitrogen, Carlsbad, CA). The cDNA was serially diluted fivefold and was quantitatively equalized for PCR amplification. Quantitative RT-PCR was performed using the iCycler iQ real-time PCR detection system (Bio-Rad Laboratories, Hercules, CA) and SYBR Green I (Sigma, St. Louis, MO). The glyceraldehyde-3-phosphate dehydrogenase (GAPDH) gene was run simultaneously as a control and used for normalization. Non-template control wells with no cDNA were included as negative controls. Each test sample was run in triplicate. Following the standard curve method, the expression quantities of the examined genes were determined using the standard curves and the Ct values, and were normalized using GAPDH expression quantities. The PCR conditions were 94°C for 3 min, followed by 40 cycles at 94°C for 30 sec, 60°C for 30 sec, and 72°C for 30 sec, using a melting curve program (increasing temperature from 55 to 95°C with a heating rate of 0.5°C per 10 sec) and continuous fluorescence measurement. Sequence-specific products were identified by generating a melting curve. The Ct value represents the cycle number at which a fluorescent signal rises statistically above background and the relative quantification of gene expression was analyzed by the2-ΔΔCt method . Based on the quantification RT-PCR results, hierarchical clustering was performed, and the relative quantification of gene expression was normalized to the Ct of stage X as a control group. We thank Seoulin Bioscience Corporation (Seoul, Korea) for Genechip data generation. This work is supported in part by a grant from BioGreen 21 Program of the Rural Development Administration and by the Brain Korea 21 Project of the Ministry of Education. The work of Taesung Park was partially supported by the National Research Laboratory Program of Korea Science and Engineering Foundation. BRL carried out all the microarray experiment and quantitative RT-PCR, HK, SC and TP carried out the microarray data analysis, JYH, JML and HK conceived and coordinated the study, and BRL and TSP wrote the manuscript. Figures and quantitative RT-PCR results were prepared by BRL and SM. All authors read and approved the final manuscript.